In queer circles, it's easy to get excited about this or that LGBT movie as there are so few of them that really stand out. It's like how everyone and their gay dog had to watch Love of Siam (which I still haven't seen oddly enough) and then there was Weekend that stood out for many. Such is the pink entertainment cycle, I suppose. 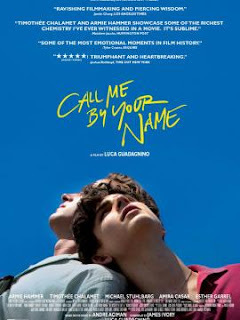 The most recently movie that got lot of the folks in my queer circle talking was Call Me By Your Name, which was adapted from a book of the same name. And it was the right sort of movie to get some notice at the Academy Awards, although as expected it didn't really win big either. As this movie focuses on a May-December romance, I wasn't quite sure how I wanted to feel about it. A lot of is well-done in terms of how it was shot and how the story was structured. But the movie also left me with a bit of a creepy vibe more than leaving me enamored by young love or something like that. So let's unpack that. Synopsis: Call Me By Your Name is a coming-of age LGBT drama movie directed by Luca Guadagnino. The screenplay was written by James Ivoy as based on the novel of the same name by André Aciman. The movie has received numerous awards nominations and won Best Adapted Screenplay at the 90th Academy Awards. Elio (Timothée Chalamet) is a 17-year-old American-Italian boy living with his parents in Italy. His rather is a professor of archeology and just invited Oliver (Armie Hammer), a 24-year-old American grad student to live with them for the summer and help with his work. Elio is initially antagonist towards Oliver as his arrival forced him from his bedroom and his personality seems totally different from Elio's more reserved, introvered self. Oliver makes some efforts to reach out to Elio but the younger teen just pulls way and loses himself in his books or spends more time with his girlfriend Marzia (Esther Garrel). But it turns out that Oliver is actually attracted to Elio despite taking a girlfriend in town. And it takes a while for Elio to get over his own shyness in order to open up to the possibility of exploring something with the older man. But the two find a connection that pulls them closer to one another and the rest of the summer becomes a chance for them to explore one another and figure out what all this is. What I Liked: While it takes a while for the movie to start up in earnest, once it gets there it is quite beautiful. Chalamet is a rather brilliant young actor and he does an amazing job of bringing Elio to life in all of his teenage emotional complexity. So much of the movie rides on him and he delivers masterfully from start to finish. In terms of cinematography, they also selected some very interesting locations for shooting the movie. Sure it just shows that I've never been to Europe so my only frame of reference is other movies about the region, but on the whole it's quite beautiful. It's practically a low key tourism vidoe for spending a summer in Italy. Just watch out for those peaches. What Could Have Been Better: I know that by the numbers the age gap between Elio and Oliver isn't that significant. However in many countries Elio would stillbe considered to be underaged and the actors look like they have a much wider age gap for one reason or another. So that just builds on the whole creep factor that prevents me from fully embracing this romance and wanting to go "Aww" at their time together. This feeling did not get any better when it was revealed that the parents were pretty much supporting this relationship to flourish despite the age difference and the very limited time of the summer. This was one of those LGBT stories that involved Elio having the most perfect parents in the world and those get old really fast. But hey, you need that in order to enable the story, I totally get it. And the father had to have some history in order to be more accepting of this May-December bisexual romance. But it also felt a little trite that things lined up in that manner. TL;DR: Call Me By Your Name is still a beautiful, well-crafted movie that tries to capture young love and paint its beauty with all the colors in the box. It has its share of uncomfortable moments and odd pacing bits, but that will depend on your personal taste I suppose. Thus the movie gets a good 4 beautiful Italian summer days out of a possible 5.